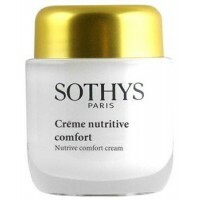 Sothys Energizing Intensive Comfort Cream cream reveals the skin's youthfulness by restoring luminosity & radiance. Siberian Ginseng protects and optimizes cellular energy for improved skin health and quality, and prevents and diminishes signs of aging. Formulated with rice peptides and lupine extracts, this daily moisturizer improves microcirculation and boosts the energy production and skin oxygenation.